J. Braithwaite (2015) ‘Rethinking Criminology through Radical Diversity in Asian Reconciliation’ Asian Journal of Criminology 10, 181-183. J. Braithwaite (2015) ‘Cascades Across an Extremely Violent Society: Sri Lanka’ International Journal of Conflict and Violence 9(1). J. Braithwaite (2014) ‘Hybridity in the Craft of Canadian Criminology’ Canadian Journal of Criminology and Criminal Justice 56(4), 399-416. J. Braithwaite (2013) ‘One retrospective of Pacific criminology’ Australian and New Zealand Journal of Criminology 46, 3-11. J. Braithwaite (2012) ‘Cascades of violence and a global criminology of place’ Australian and New Zealand Journal of Criminology 45(3), 299-315. S.Dinnen and J. Braithwaite (2007) ‘Reinventing Policing Through the Prism of the Colonial Kiap’ Community Policing in Three Dimensions Conference, 12-14 December 2007. Canberra: The Australian National University. C. Kapuscinski, J. Braithwaite and B. Chapman (1998) ‘Unemployment and Crime: Towards Resolving the Paradox’ Journal of Quantitative Criminology 14(3), 215-243. J. Braithwaite (1996) Towards Criminology. In Kayleen M. Hazlehurst (ed.) Crime and Justice: an Australian Textbook in Criminology, 1-12. Sydney: The Law Book Company Limited. J. Braithwaite and D. Chappell (1994) ‘The Job Compact and Crime’ Current Issues in Criminal Justice 5, 295-300. J. Braithwaite (1993) ‘Following the Money Trail to What Destination? An Introduction to the Symposium’ Alabama Law Review 44(3), 657-68. 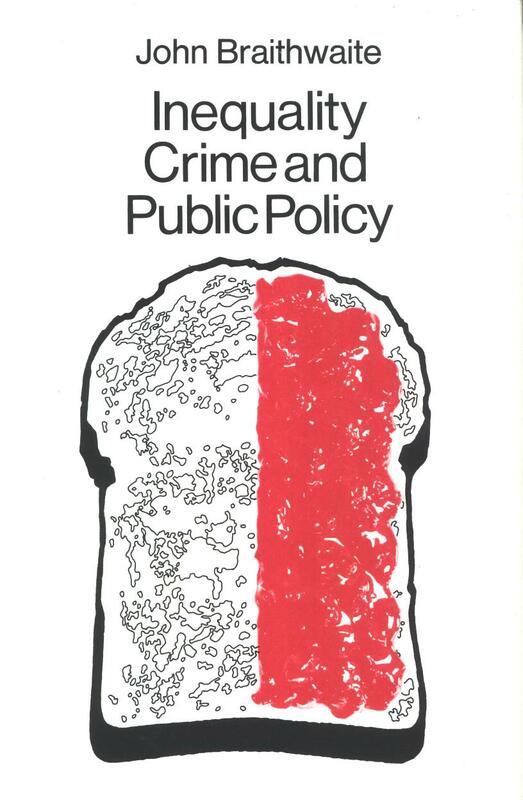 J. Braithwaite (1992) Good and Bad Police Services and How to Pick Them in Peter Moir and Henk Eijkman (eds) Policing Australia. Melbourne: Macmillan. J. Kelley and J. Braithwaite (1990) ‘Public Opinion and the Death Penalty in Australia’ Justice Quarterly 7(3), 529-563. J. Braithwaite (1988) ‘Crime’ in J. Najman and J. Western (eds), A Sociology of Australian Society. Melbourne: Macmillan. Revised with K.M. Hazlehurst for the second edition, 1993. J. Braithwaite (1986) ‘Prison Industry: The Key Policy Dilemmas’ in R. Schliemann (ed.) Working: A Way to the Future. Sydney, N.S.W: Department of Corrective Services. 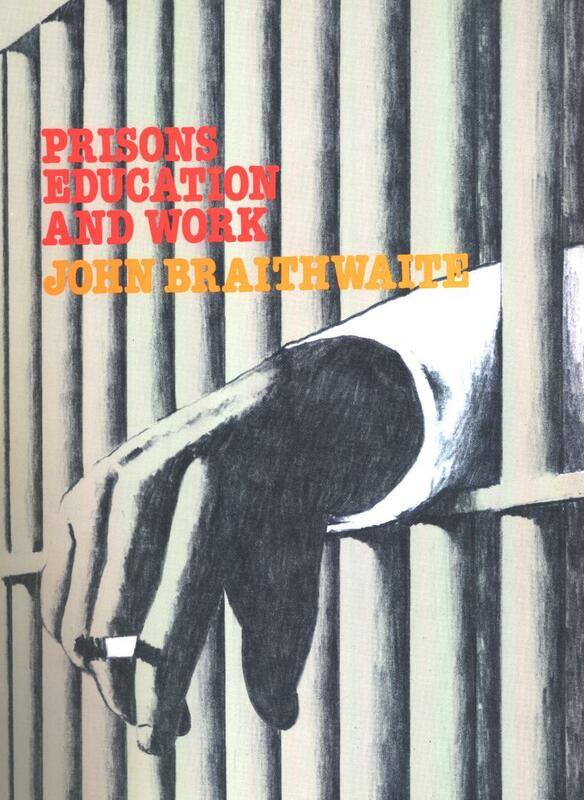 J. Braithwaite (1984) ‘Prisons, Education and Work: One Step Forward, Two Steps Back’ Australian and New Zealand Journal of Criminology 17, 49-57. J. Braithwaite and D. Biles (1984) Victims and Offenders: The Australian Experience in Richard Block (ed.) Studies of Victimization. Washington D.C.: National Institute of Justice. J. Braithwaite (1982) Paradoxes of Class Bias in Criminal Justice in H. Pepinsky (ed.) Breaking the Criminological Mold: New Premises, New Directions. Beverly Hills: Sage. J. Braithwaite, D. Biles and R. Whitrod (1982) Fear of Crime in Australia in H.J. Schneider (ed.) The Victim of International Perspective. Berlin and New York: Walter de Gruyter. Translated into German as: Verbrechensfurcht in Australien, in H.J. Schneider (ed.) (1982) Das Verbrechensopfer in der Strafrechtspflege, Berlin, Walter de Gruyter. J. Braithwaite and V. Braithwaite (1981) ‘Delinquency and the Question of Values’ International Journal of Offender Therapy and Comparative Criminology 25, 273-289. J. Braithwaite and D. Biles (1980) ‘Crime Victimisation in Australia: A Comparison with the U.S.’ Journal of Crime and Justice 3, 95-110. J. Braithwaite and D. Biles (1980) ‘Overview of Findings from the First Australian National Crime Victims Survey’ Australian and New Zealand Journal of Criminology 13(1), 41-51. J. Braithwaite and V. Braithwaite (1980) ‘The Effect of Income Inequality and Social Democracy on Homicide: A Cross-National Comparison’ British Journal of Criminology 20(1), 45-53. J. Braithwaite and D. Biles (1980) ‘Women as Victims of Crime: Some Findings from the First Australian National Crime Victims Survey’ Australian Quarterly 52(3), 329-339. J. Braithwaite (1980) Political Economy of Punishment in E.L. Wheelwright and K. Buckley (eds) Essays in the Political Economy of Australian Capitalism Volume IV. Sydney: ANZ Books. J. Braithwaite and D. Biles (1980) ‘Crime Victimisation Rates in Australian Cities’ Australian and New Zealand Journal of Sociology 16(1), 79-85. D. Biles and J. Braithwaite (1979) ‘Crime Victims and the Police’ Australian Psychologist 14(3), 345-355. J. Braithwaite and M. Cass (1979) ‘Note on the Demographic Composition of Australian Police Forces and Prisons Services’ Australian and New Zealand Journal of Criminology 12, 132-138. J. Braithwaite and D. Biles (1979) ‘On Being Unemployed and Being a Victim of Crime’ Australian Journal of Social Issues 14(3), 192-200. D. Biles, J. Braithwaite and V. Braithwaite (1979) ‘The Mental Health of Victims of Crime’ International Journal of Offender Therapy and Comparative Criminology 23(2), 129-134. P.R. 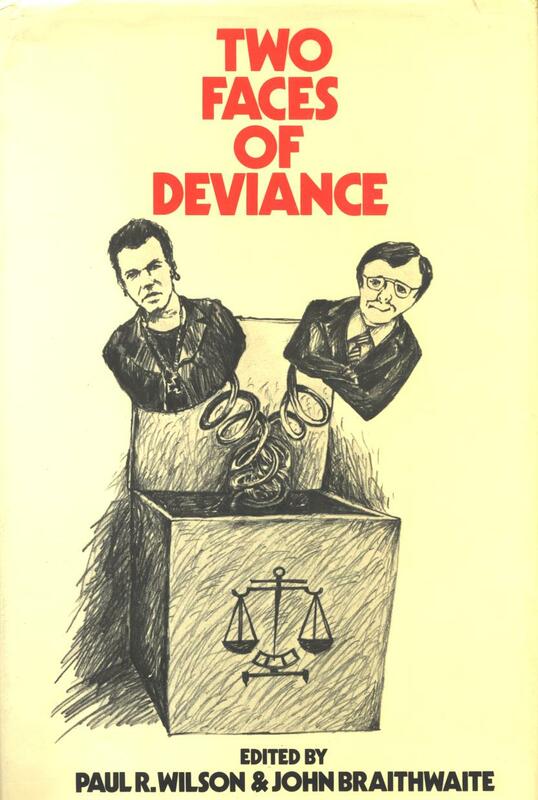 Wilson and J. Braithwaite (eds)(1978) Two Faces of Deviance: Crimes of the Powerless and Powerful. Brisbane: University of Queensland Press. J. Braithwaite and V.A. Braithwaite (1978) ‘An Exploratory Study of Delinquency and the Nature of Schooling’ Australian and New Zealand Journal of Sociology 14(1), 25-31. J. Braithwaite and H.G. Law (1978) ‘The Structure of Self-Reported Delinquency’ Applied Psychological Measurement 2(2), 221-237. J. Braithwaite and B. Condon (1978) On the Class Basis of Criminal Violence in P.R. Wilson and J. Braithwaite (eds) Two Faces of Deviance: Crimes of the Powerless and Powerful. Brisbane: University of Queensland Press. J. Braithwaite (1978) ‘Unemployment and Adult Crime: An Interpretation of the International Evidence’, Proceedings of the Institute of Criminology No. 36, Unemployment and Crime, Sydney University Law School (To be reprinted in M. Findlay (ed.) Issues on Crime Control). P.R. Wilson and J. Braithwaite (1977) The School, Truancy and Delinquency in P.R. Wilson (ed.) Delinquency in Australia. Brisbane: University of Queensland Press. J. Braithwaite (1977) Australian Delinquency: Research and Practical Considerations in P.R. Wilson (ed.) Delinquency in Australia. Brisbane: University of Queensland Press. J. Braithwaite (1975) ‘Competitiveness in Schools and Delinquency’ Australian Journal of Social Issues 10(2), 107-110. J. Braithwaite (1975) ‘Population Growth and Crime’ Australian and New Zealand Journal of Criminology 8(1), 57-61. P. Wilson, J. Braithwaite, A. Guthrie & G. Smith (1975) Truancy. Report to the Commonwealth Commission of Enquiry into Poverty, Department of Anthropology & Sociology, University of Queensland. [report].